In my 350th post I mentioned that I would be concentrating on looking at Linux applications as well as distributions. I’m going to start with the major applications and then move on to lesser known utilities as time goes on. 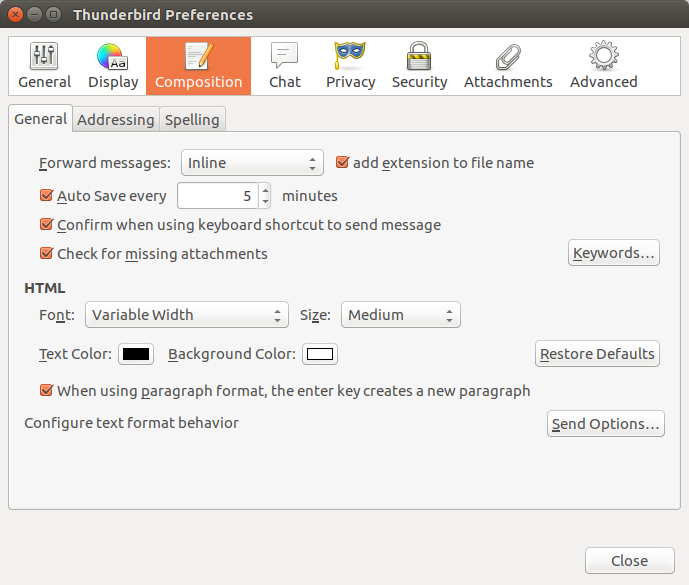 In this post I will be describing the features of Thunderbird which is an email client created by Mozilla who are the same people who developed the Firefox web browser. 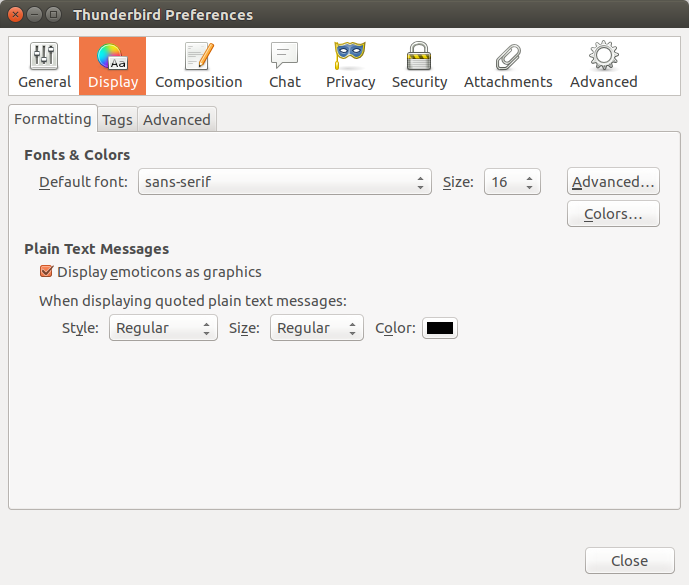 Many of the top Linux distributions have Thunderbird installed by default. If it isn’t installed it will almost certainly be available via the graphical package manager. 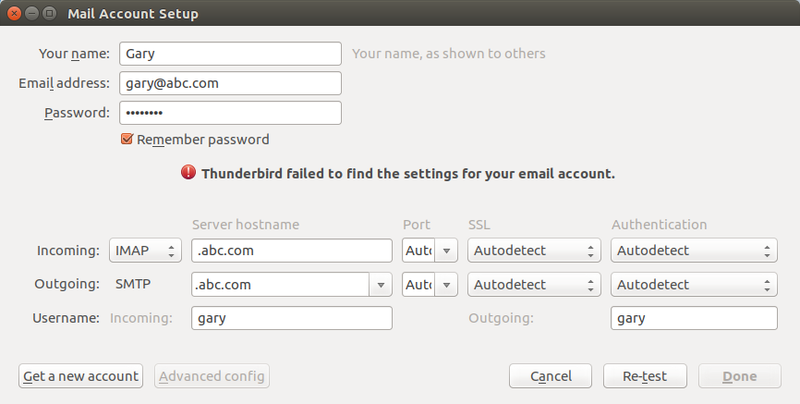 When you first run Thunderbird you won’t have any accounts set up. You can attach an existing mail account by selecting “File -> New -> Existing Mail Account” or you can create a new mail account by selecting “File -> New -> Create New Account”. 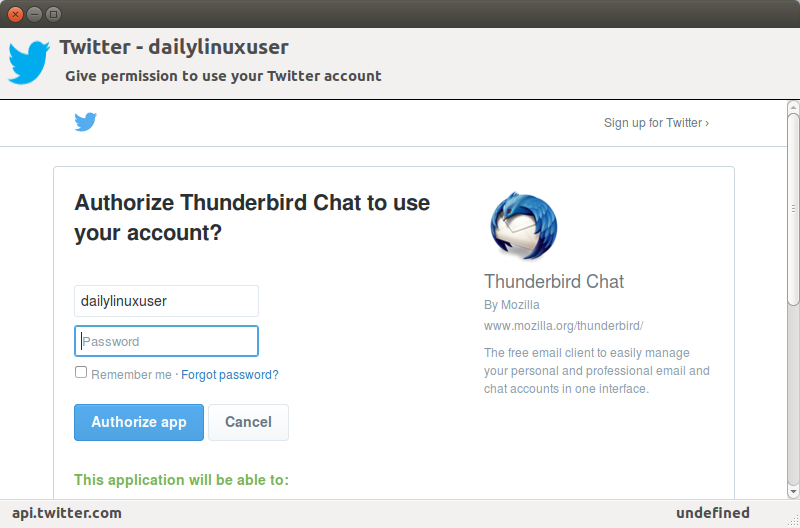 Personally I would skip creating a new account within Thunderbird if you need an email account. You would be better off going to Google.com and creating a GMail account as it is free. If you have an email account with a major service provider such as Google then you can add an account simply by entering your email address and password. 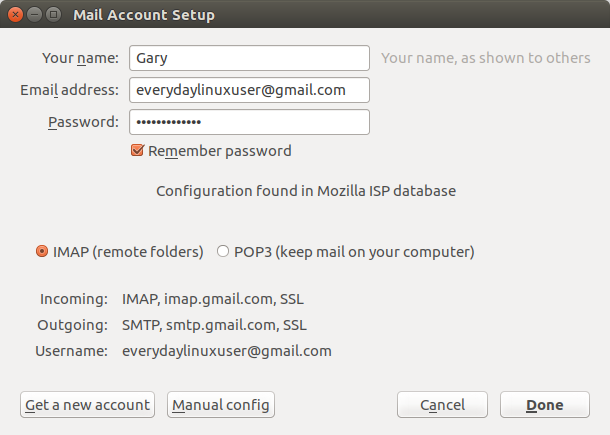 If however you use a mail provider not recognised by Thunderbird then you will need to enter the details for the account manually by filling in the following screen. 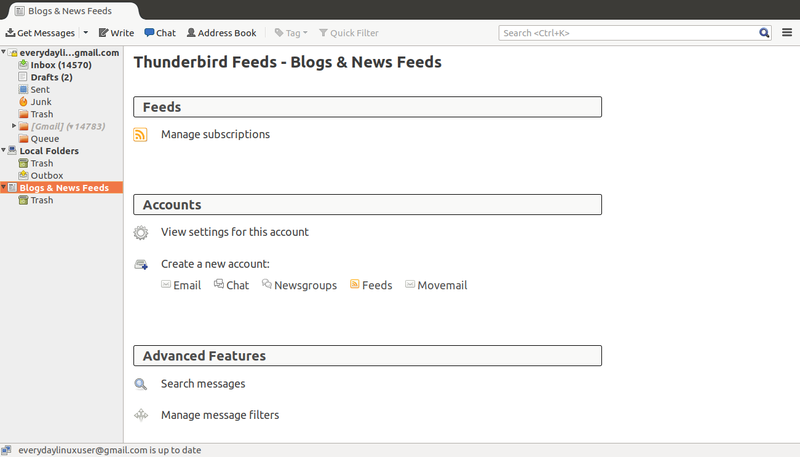 The classic view within Thunderbird has a list of accounts in the left panel, a list of messages in the top right panel and a preview pane in the bottom right. You can make columns visible by placing a tick next to them and you can order them by dragging them into position. When you click on an email which contains images or other elements you will see a message stating that the content has been blocked. By clicking on the “Preferences” link you will see options to display the elements for this message and you will be able to allow content from the sites that the content is pulled from. 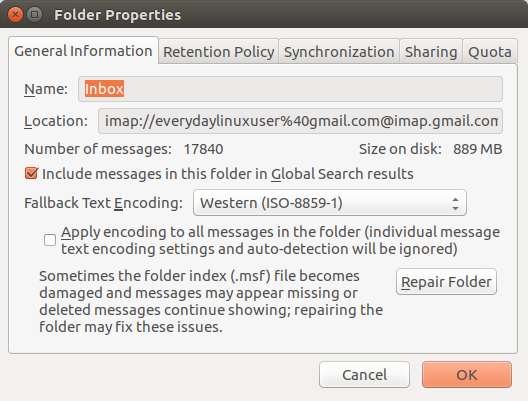 Thunderbird includes all of the common folders from your email provider such as spam and trash. 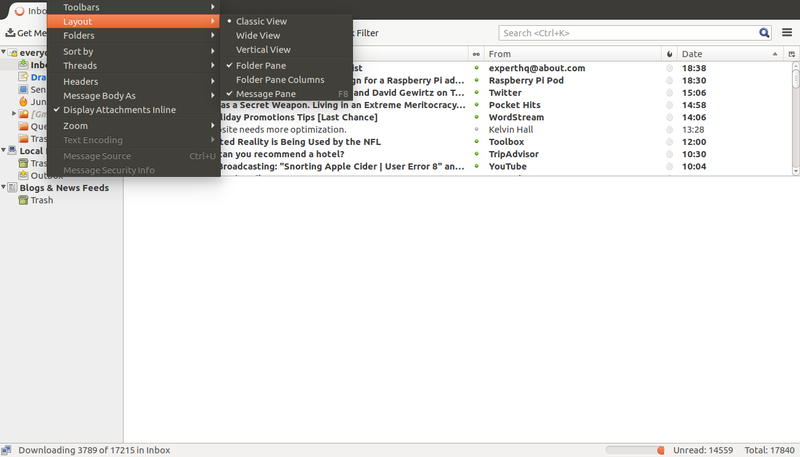 You can filter any folder by applying a quick filter. Entering text into the box provided will reduce the list to show items that contain that text. There are also other ways you can filter items such as by unread, starred, contacts, tags and whether the mail has attachments. The get messages button enables to pull new mail from all of your attached mail accounts or you can choose a specific account. The write option allows you to create a new message, chat lets you view the chat window (which I will come to later on). 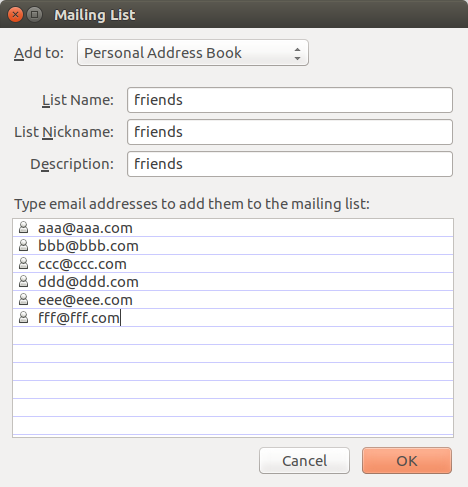 The address book lets you create and view contacts, the tag option lets you tag messages by priority. You can however from the tag menu add new tags and remove existing ones. The quick filter button lets you apply filters to the current folder and the search box lets you search your email folders for messages. To create a new message click on the “Write” toolbar button. The interface for creating new messages is both easy to use yet powerful. The from field is set up by default. You can then choose to add “To”, “CC”, “BCC” or “Reply To” as options and then specify the addresses next to them. You have the freedom to create emails as you see fit in an HTML format. For instance all 7 heading types are available, you can change the text colour and make text bold, italicised or underlined. You can also add bullet points, numbering and indent and format text to the right, left and centre justified. The new message toolbar has a button for adding a hyperlink. You can add text and set the location of the link. To insert an image click on the “Choose File” button and find the image file. 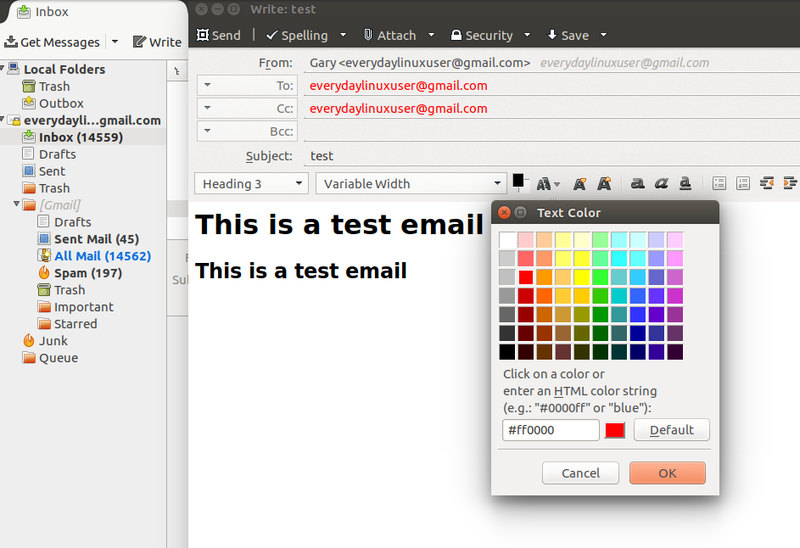 You can add alternate text which is displayed by email clients that don’t show images or block them. 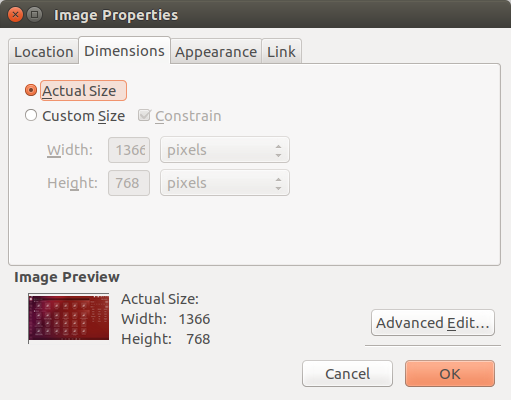 The “Dimensions” tab lets you choose whether to show the image in its actual size or by dimensions that you enter. 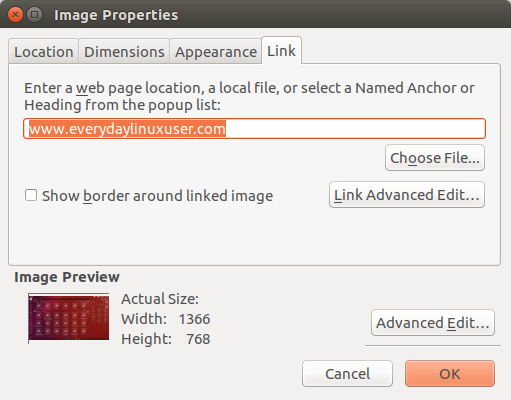 The “Appearance” tab lets you add spacing around the image and choose a border size. Finally you can add a URL so that when the image is clicked the webpage will be opened in the reader’s default web browser. Another feature you can use is the ability to turn delimited data into tables. This is useful if you want to copy data from a spreadsheet package. 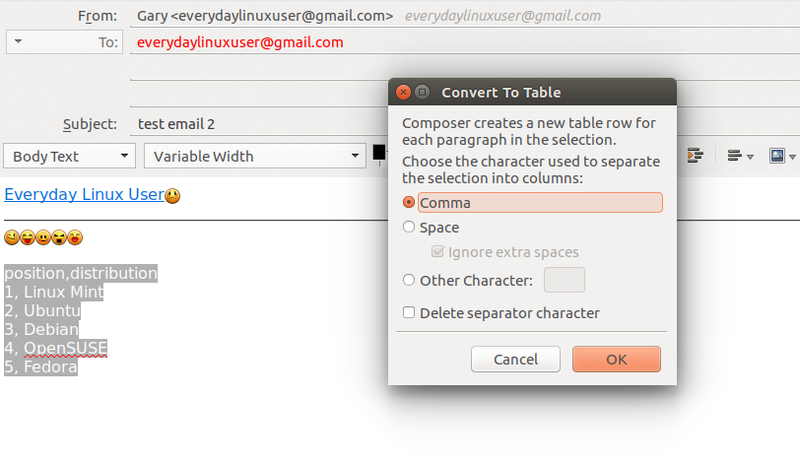 By selecting all the text and clicking on the tables toolbar item you can turn the data into a table. When you have finished formatting the message you can add files as attachments by clicking the toolbar icon at the top of the window and choosing the files to attach. You can also check the spelling by clicking on the “Spelling” toolbar button. Creating an email is one thing but obviously you will want to reply, forward and delete emails. You can select an email by clicking on it in the messages panel within any folder. You can open it fully by double clicking on it. 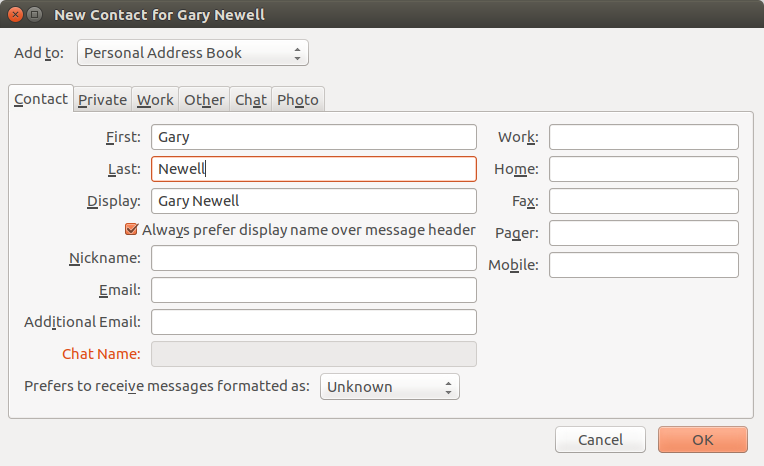 The reply and forward options provide the same editor as the new message option. For each mail folder you can view the properties by clicking the “Edit -> Folder Properties” menu option. The general information tab tells you the name of the folder you are looking at and the location of that folder. You will also see the number of messages and the amount of disk space they take up. An important option on this screen is the ability to choose whether messages in this folder are available within the search facility. Whilst you will want this checked for your inbox and sent items you will probably want to switch it off for spam. If Thunderbird doesn’t appear to be working properly and showing all the emails it should be the first port of call should be to repair the folder using the button provided on the general tab within folder settings. You can also choose whether to keep or not keep starred messages. 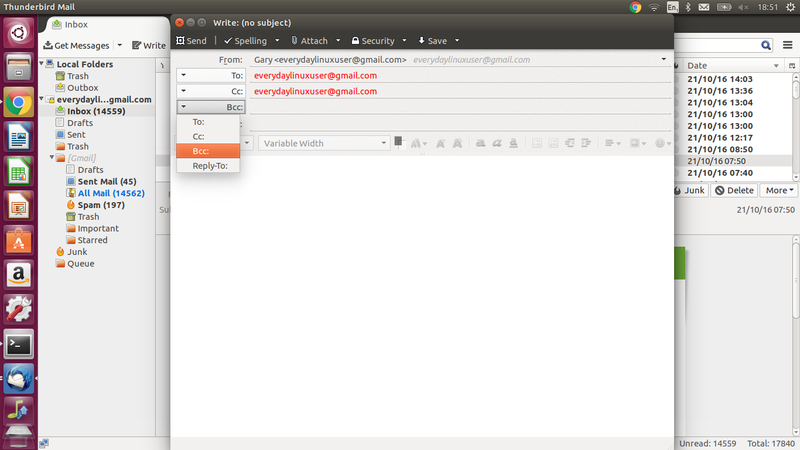 The synchronisation tab is used for synchronising messages between the mail server and your computer. By synchronising your folders you can read your mail messages even when you aren’t connected to the internet. The download now button instantly downloads messages. 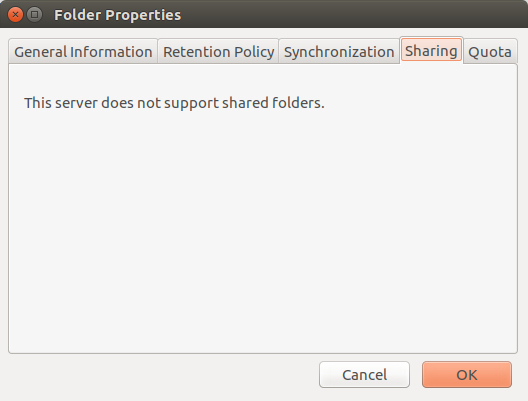 Depending on the mail provider you can determine whether a folder is shared or not. GMail does not support shared folders. The quota tab shows how much space has been used and the amount of space you have left available. 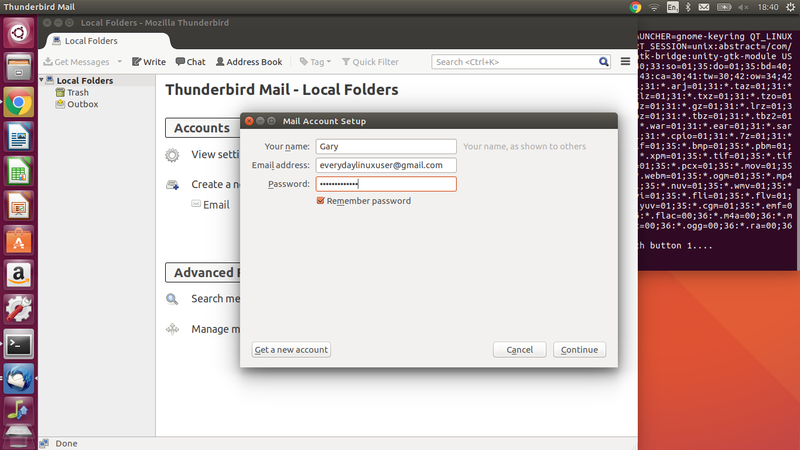 Thunderbird has a whole host of individual account settings that can be applied. To show the account settings select “Edit -> Account Settings” from the menu. The first page shows the account name and your identity details. The identity details shows your name, email address, reply to address and organisation (if applicable). 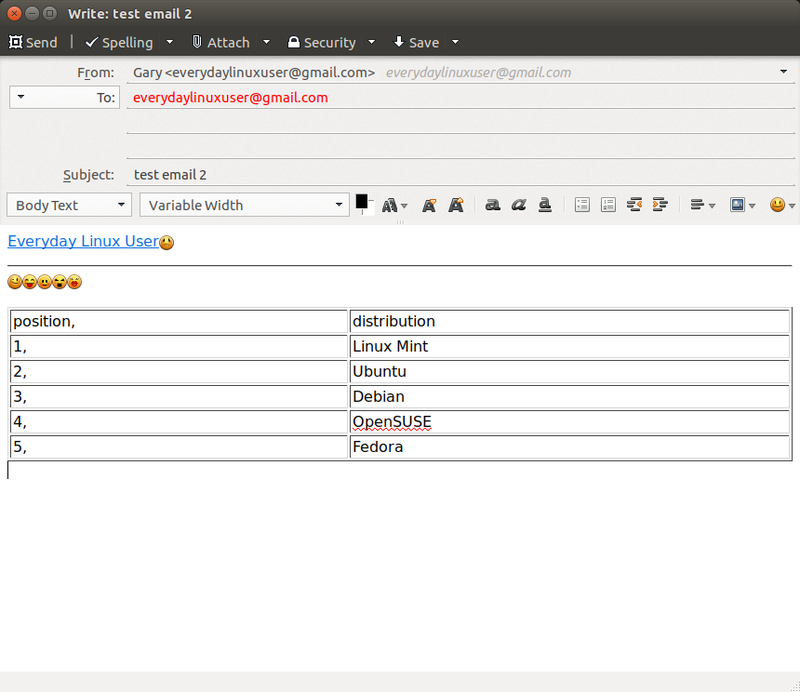 You can also set up a signature which will be applied to all the emails that you send. You can apply HTML to your signature to make text bold, italicised, underlined and different colours. You can also attach a vcard to all of your messages which makes it easier for people to get in contact with you. 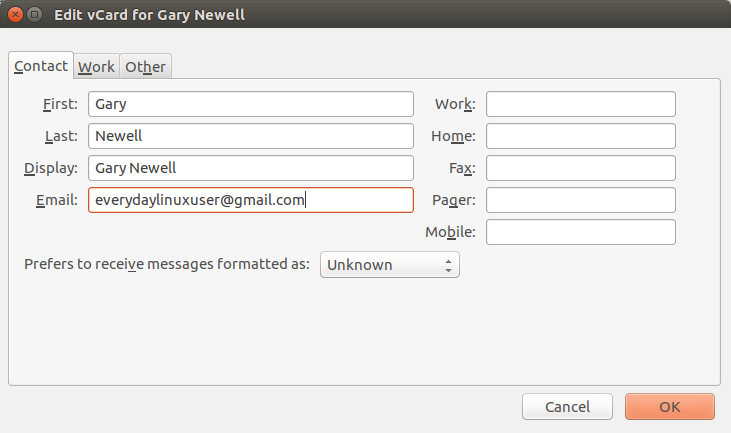 The contact tab has fields for your name, display name, email address, work, home, fax, pager and mobile numbers. You can also specify whether you prefer to receive plain text or HTML emails. The work tab has fields for your job title, department, organisation, work address and web page. Finally the other tab lets you add notes. Also on the account settings screen you can choose to manage identities which I will cover later on. 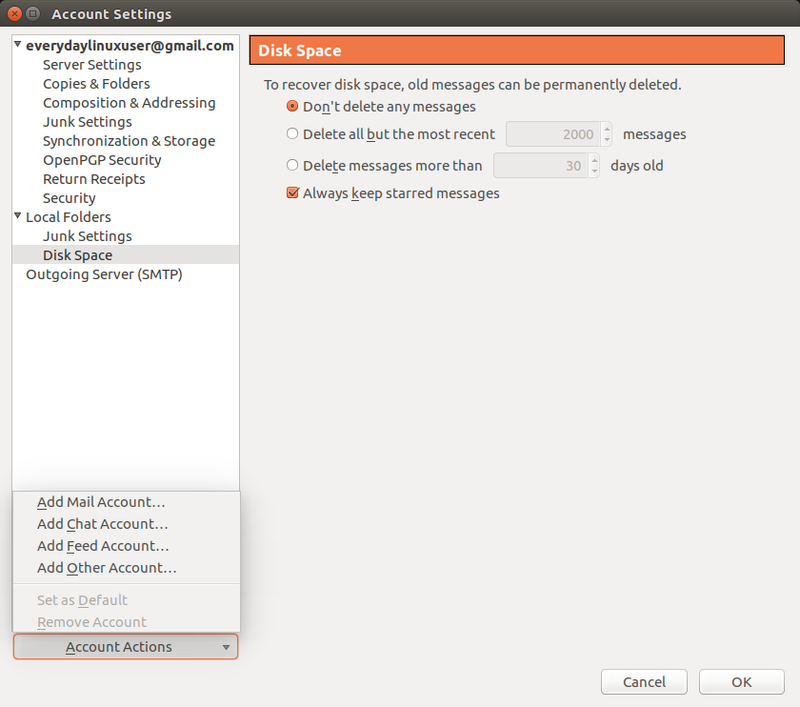 The server settings screen starts off with your username and server settings and the port number used to connect to the mail server. You can also choose the security and authentication methods. Unless you are having issues the more important settings are just below this under the heading server settings. You can choose whether to check for new messages at startup, how often to check for new messages, allow notifications when new messages arrives and what to do when a message is deleted. 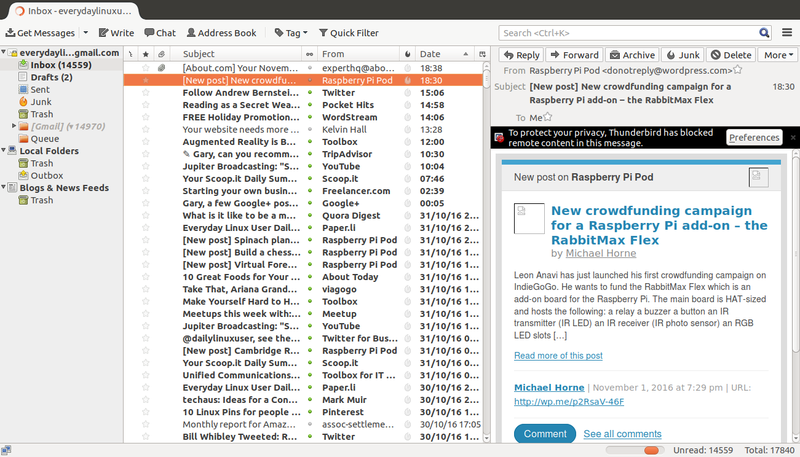 Finally there are options to empty the trash on exit and clean up your inbox on exit. The first section lets you determine what to do with sent messages. You can place a copy in a specific folder and additionally send to a cc’d account or bcc’d email account. The message archives lets you decide where to store message archives. 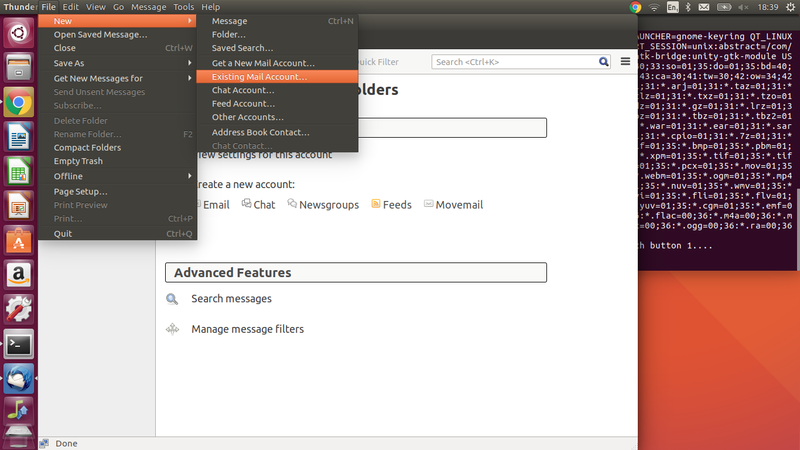 You can choose between the mail server and local folders. The draft and templates section determines where draft emails are stored and templates for emails are stored. The composition tab lets you determine what happens when you create email messages. You can choose whether emails are created in HTML or text format, whether to automatically quote original message when replying and where to put the reply (above or below quote) and whether to include signature. You can also choose whether to include the signature on replies and forwards. There is a “global composing preferences” button which takes you to another settings screen which I will discuss later on. For email addresses you can choose to use a local LDAP server or a specified LDAP server. 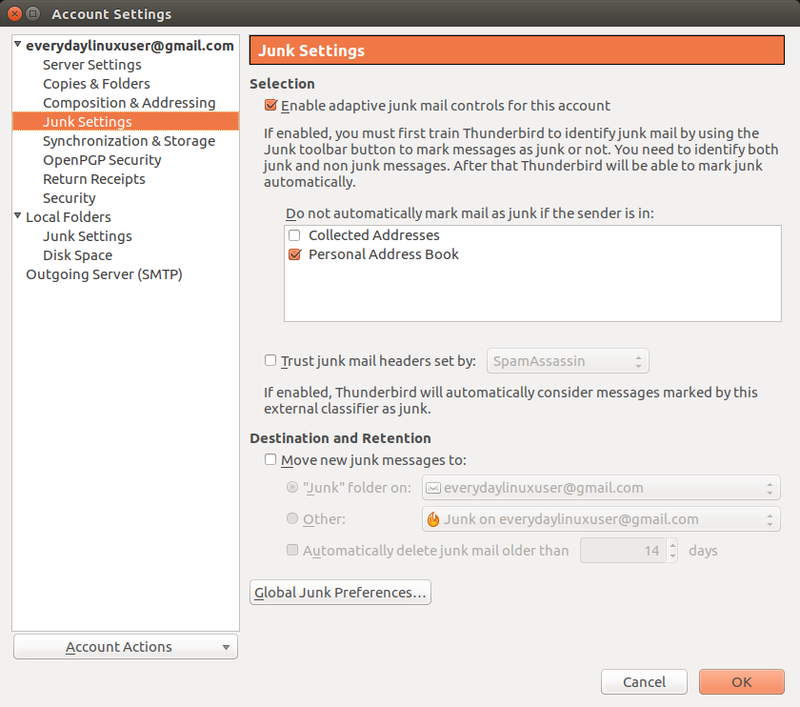 The junk settings portion of account settings lets you determine how to deal with junk mail. 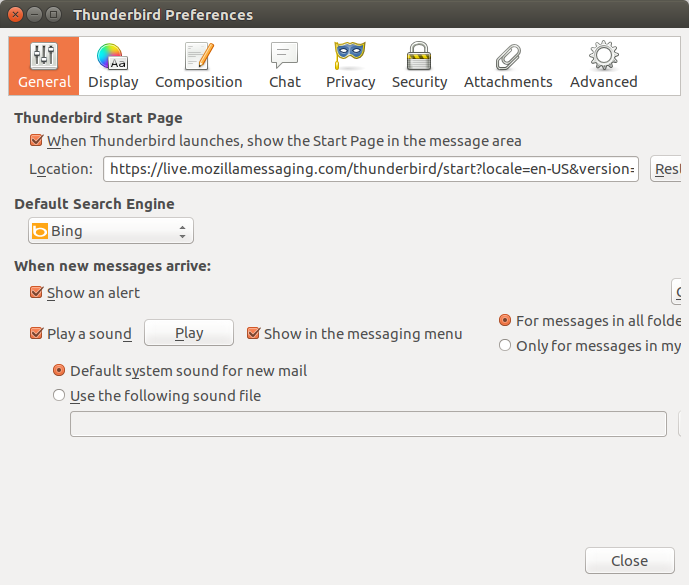 You can train Thunderbird to work out which messages go to the junk mail folders. First of all you can choose whether junk mail is turned on or off. 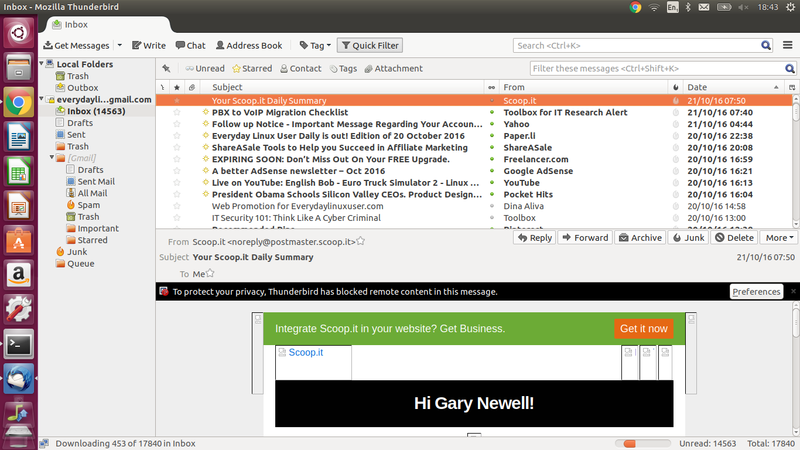 You can also use a third party tool such as spam assassin to work out what is and isn’t junk. You can also decided whether personal addresses in your address book are exempt from junk mail and whether collected addresses can be omitted from junk mail. There is an option for dealing with junk mail such as determining the folder junk mail is saved to and how long to keep it. There is a global junk preferences button which I will cover later on. 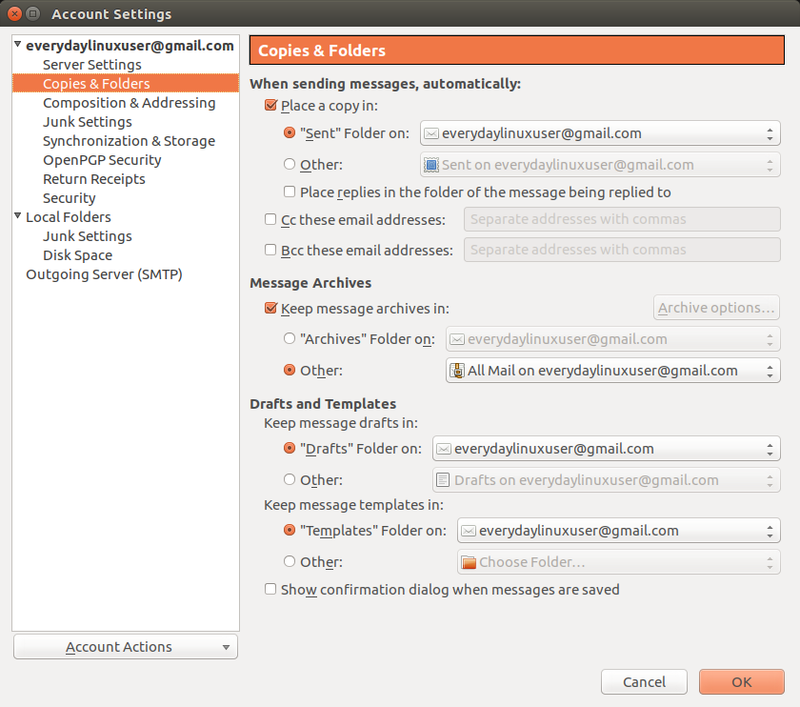 The synchronisation and storage page lets you work out how mail is stored on your computer. For disk space reasons you can choose to download all mail or limit mail to the last so many days which is specified by you. You can also choose not to download messages which are larger than a certain size. 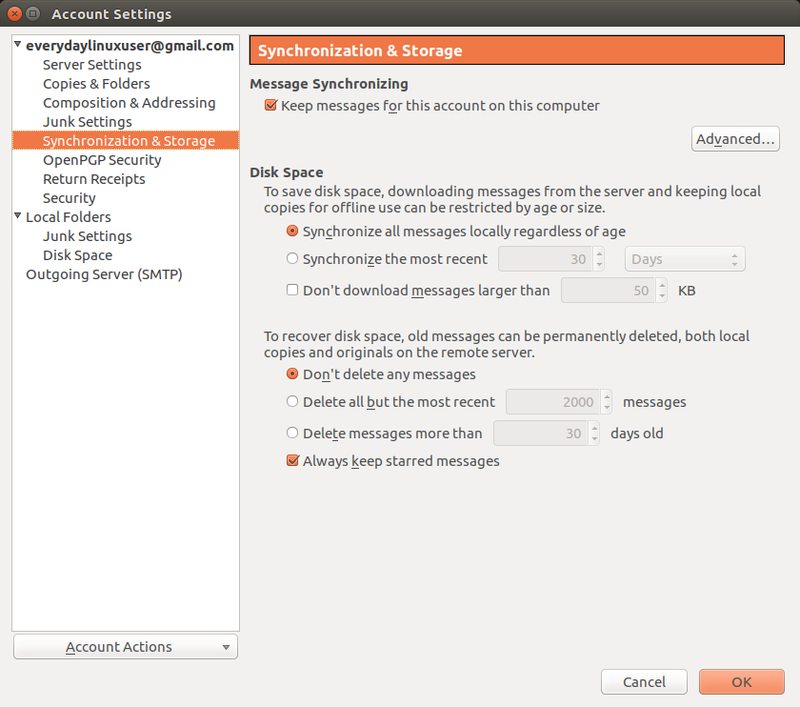 You can also choose to clean up disk space by handling deleted messages. You can choose not to delete any messages, delete all but the most recent specified number of messages, delete messages older than the specified number of days and choose whether to keep starred messages. When you receive a mail message you can let the sender know you have received it. To adjust the settings go to the “Return Receipts” page. 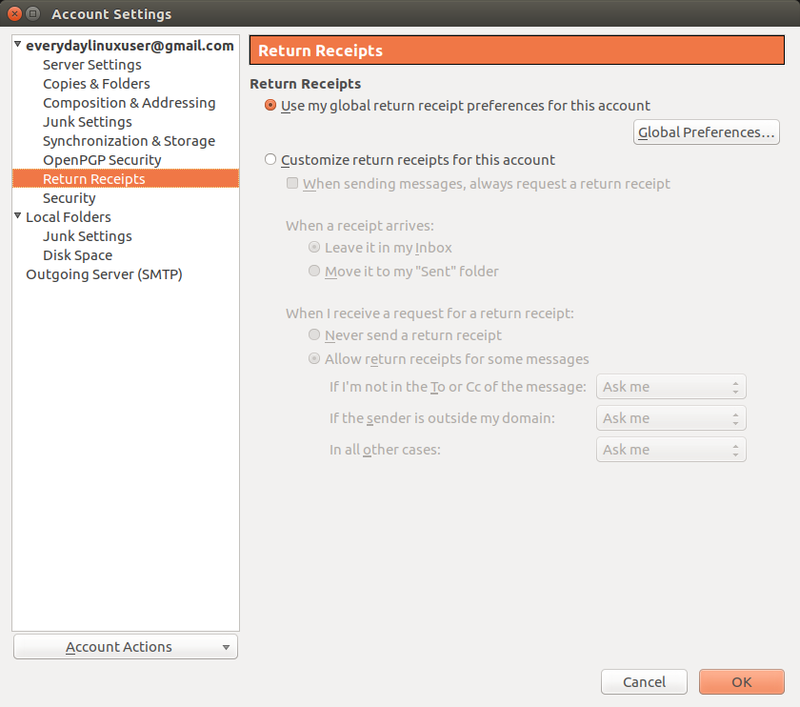 By default return receipts are set to use global preferences and will be covered later on. You can customise the return receipt settings. When sending a message you can ask for a return receipt. When you receive a receipt you can determine which folder it goes into. When receiving a message you can determine whether a return receipt is sent or not. You can determine which types of messages you send receipts for. 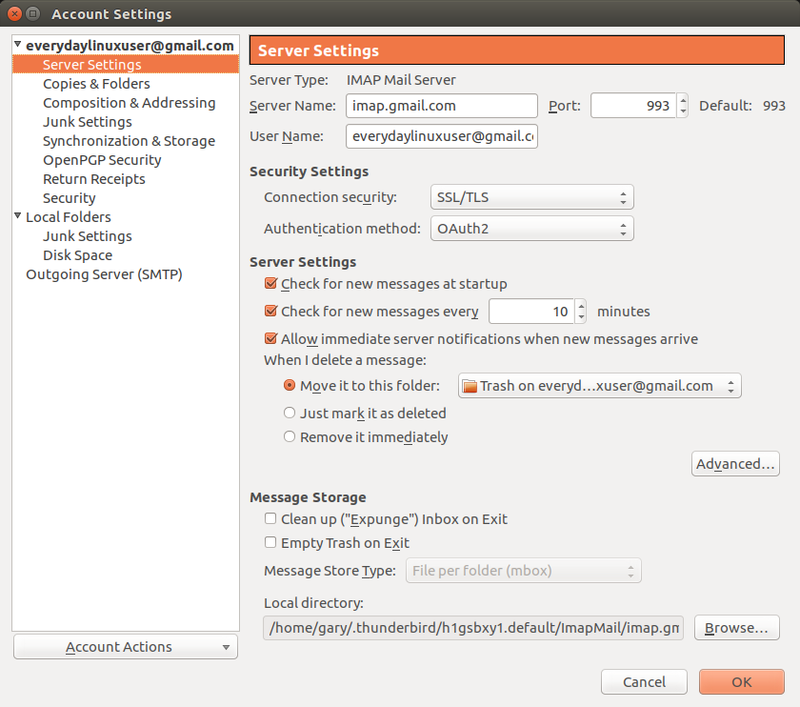 The outgoing SMTP settings page lets you choose the server used for sending emails. At the bottom of the account settings screen are options for adding new mail, chat, feeds and other accounts. The window that appears by default when you click on manage identities in the account settings screen has your name and the email address. 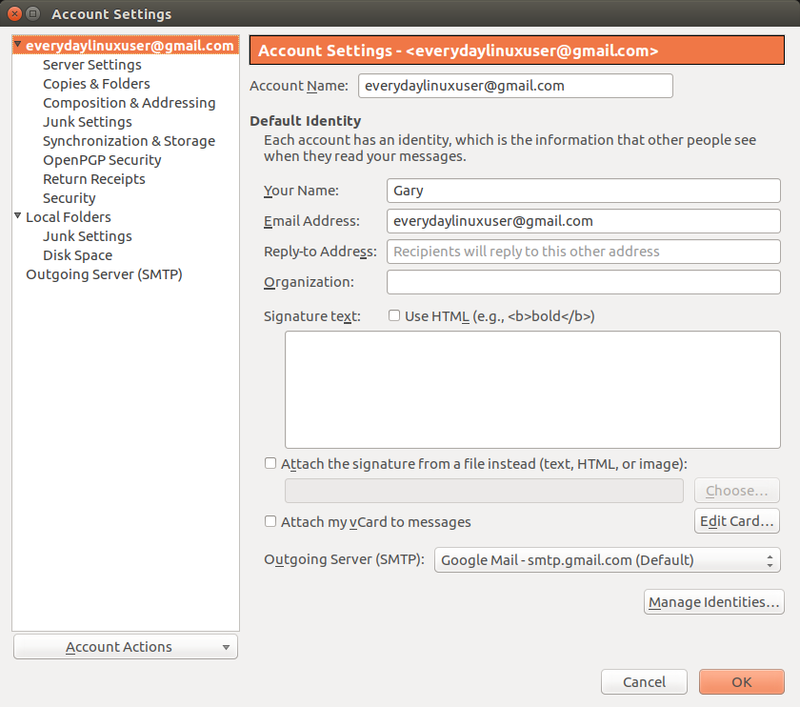 By clicking add you can choose a new identity for sending emails for the same email account. The settings screen lets you enter a name and email addresses that the recipient will see when they receive emails by this identity. 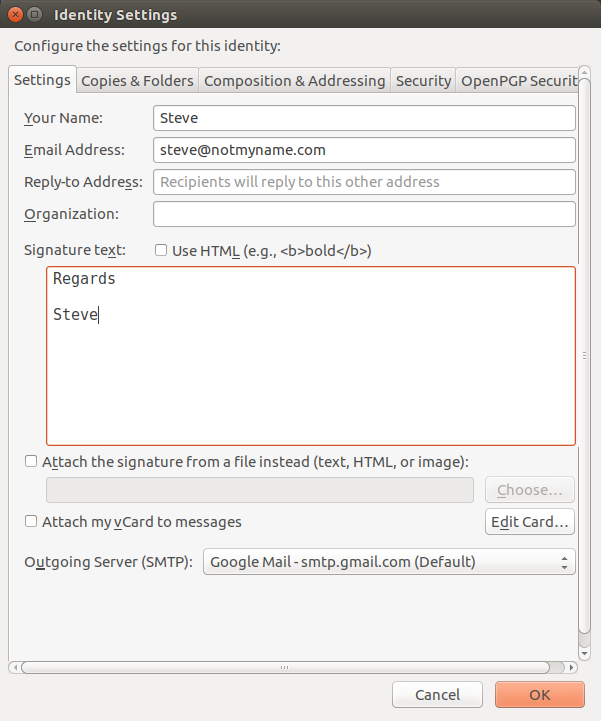 You can also set a signature and attach a vCard.Now some of you might wonder why this exists because it allows you to imitate other people when sending emails and potentially pretend to be somebody else which sounds wrong.The point of identities is so that you can manage how people perceive you. For instance you might choose one identity when talking to your friends and another when you are emailing companies.The other tabs have the same settings as the account settings screens of the same names specified earlier. 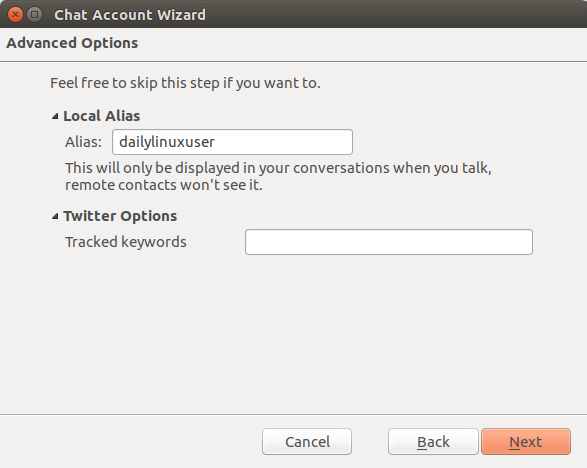 When you choose to add a chat account you can choose between a number of popular chat providers including Google and Twitter. The process differs slightly depending on the provider. For Twitter you are asked for the user name. You are then asked to specify a local alias. When you click finish you will shown the authorisation page for twitter. You can open the chat window by clicking on the chat button. The messages for twitter appear in the middle with contacts in the right panel. Clicking on a user allows you to read their tweets. You can add your own tweet by entering it in the bottom pane. 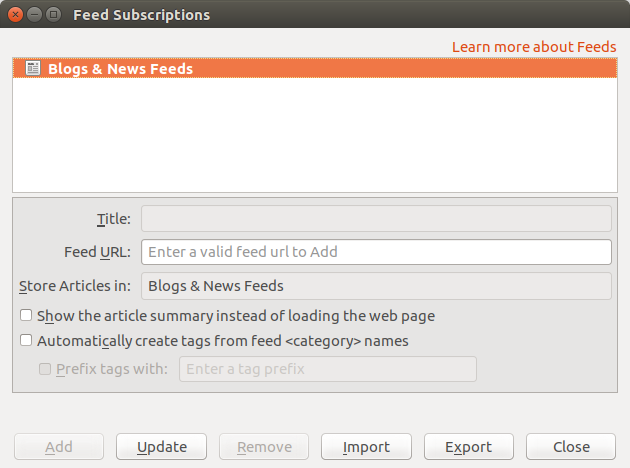 To create a feed account click “File -> New -> Feed Account” and then choose “Feed Account”. A new folder will be displayed in the left panel of the screen. Click on the “Manage Subscriptions” button to add and edit subscriptions. You can add a feed manually by entering a title and URL or alternatively click the import button to import an OPML file which is used to import a number of different feeds. 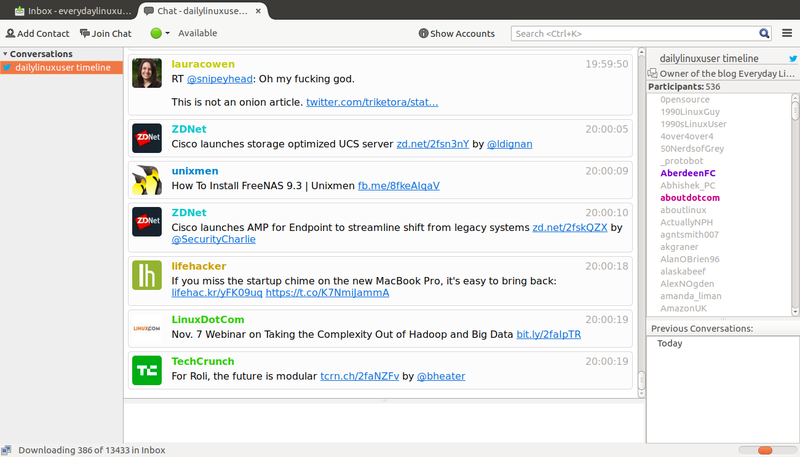 A list of messages will be loaded for the feeds and you can read them by clicking on them as if they are emails. It is a great way of keeping up to date with multiple websites in one go. There are literally hundreds of different preferences which can be configured by selecting “Edit -> Preferences” from the menu. The general tab lets you choose whether to show the start page in the message area which is the panel in the bottom right. You can also choose the search engine to use. When you receive an email you can choose to view a notification and for a sound to be played. You can choose the sound file to be played and you can choose whether to play the sound for messages in all folders or just the inbox. 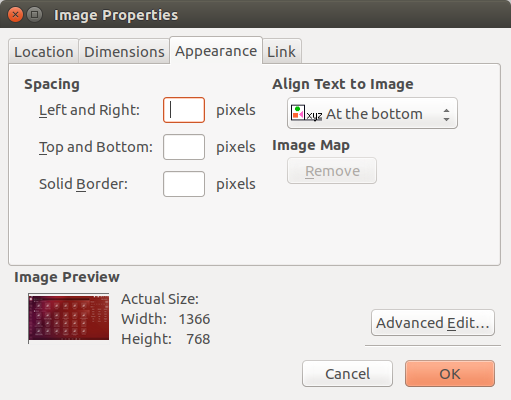 On the formatting tab you can change the font name and font size used by Thunderbird. You can also choose whether to show emoticons and how to show quoted text. 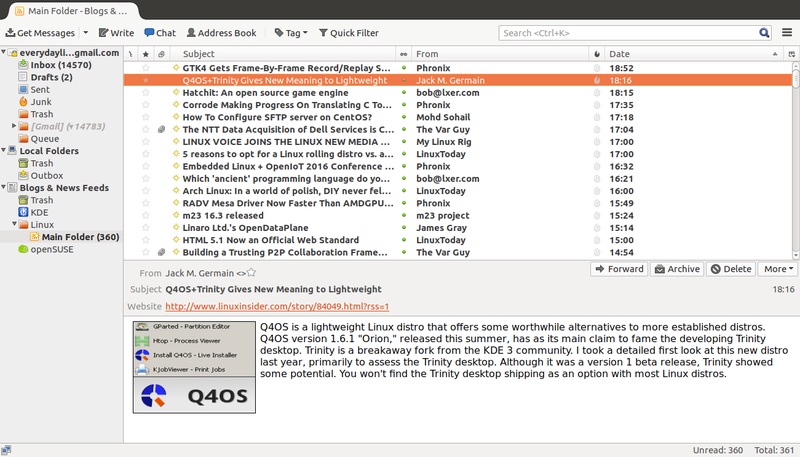 The tags tab lets you choose the tags used to mark messages which was discussed earlier. The advanced tab lets you choose whether to mark messages as read and whether to do so immediately or after a set number of seconds. You can choose whether to open messages in a new tab, new window or within an existing message window. It is also possible to close a message window when the message is moved or deleted. With regards to recipients you can choose to display their whole address or just their display name if they are in your address book. 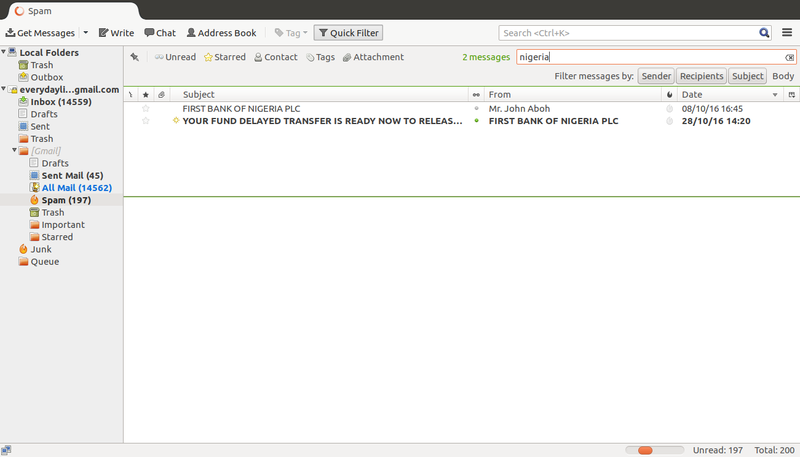 On the general tab you can choose what to do when forwarding messages. For instance you can decide whether to include the text within the message or as an attachment. Also on the general tab you can choose how often to auto save draft messages, confirm whether you want a message sent if you use a keyboard shortcut. If you are sending a message which is supposed to include an attachment you can get Thunderbird to check for missing attachments. Basically it works by looking for a set of file extensions in the email text. If it spots one and the file isn’t attached a warning will be displayed. To set up the file extensions used click on the “Keywords” button and add the extensions you need to the list. 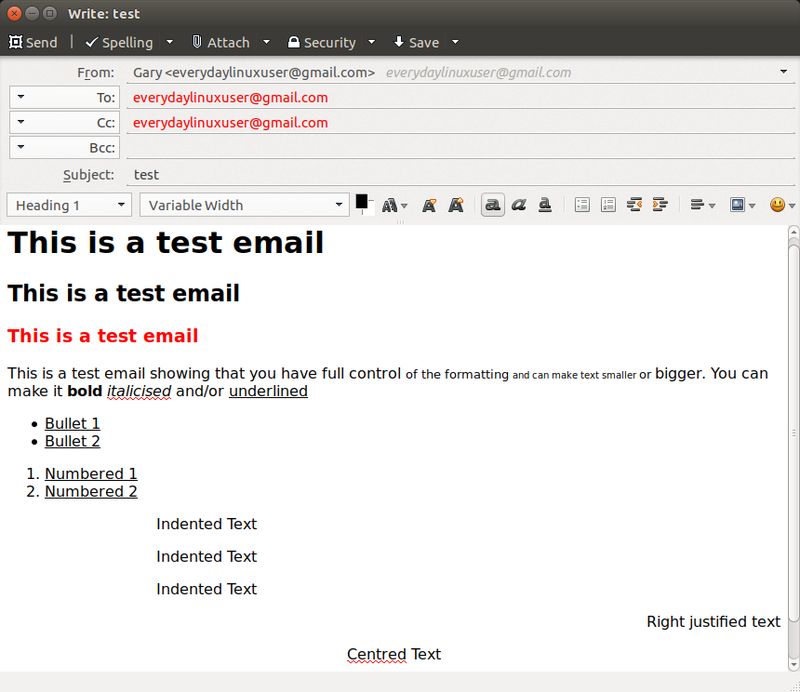 For HTML email you can choose the default font for emails and choose whether they are variable or fixed width. You can choose the default font colour and size as well as background colour. You can also choose whether the return key adds a paragraph tag (“<p>”) or a new line tag (“<br>”). The send options button lets you decide whether to use HTML or text formatting as the default for sending emails. Rather cleverly you can specify some domains so that they receive HTML emails and others to receive text format emails. 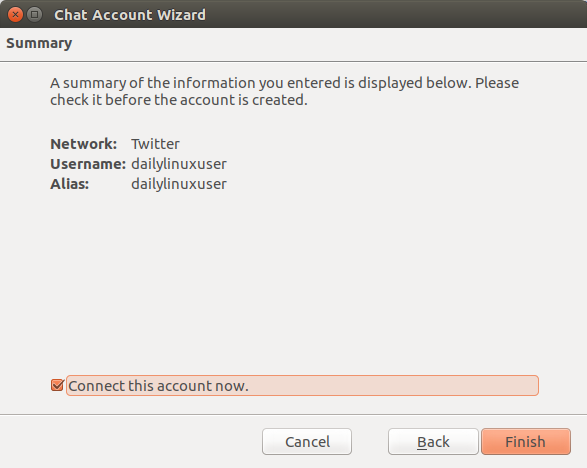 The chat tab lets you handle how people see you when you log into Thunderbird. 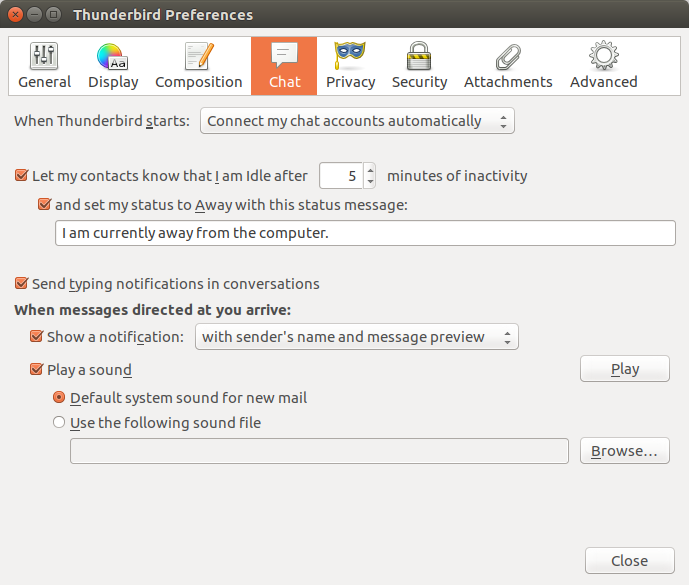 For instance you can determine whether Thunderbird automatically connects to chat servers or whether you can join manually which is good if you just want to read email and not converse. You can set your status as offline if you are idle after a certain period of inactivity and set your status as away along with a message. When a message arrives you can receive a notification with various information such as the senders name and message preview or just the senders name. You can also get new messages to play the sound of your choice. The privacy settings let you determine whether to include external content in messages you receive. If you don’t allow it then a button will appear within the message giving you the option to permit content for certain messages. 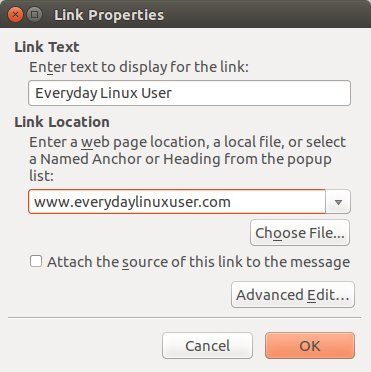 When you click on links you can determine whether to keep a history of visited links and whether to accept cookies or not. The junk tab enables you to determine what to do with junk mail and where to put junk messages. 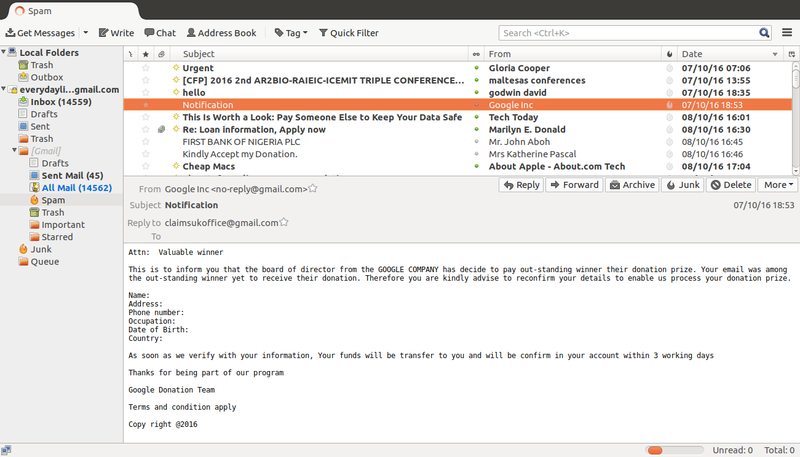 The email scams tab has an option which will enable you to be informed if a message is likely to be a scam. You can also set up antivirus software so that it scans emails before Thunderbird stores them by checking a box on the Antivirus tab. When you add accounts such as email and chat accounts the passwords are stored by Thunderbird and you can see which passwords are stored by clicking on the passwords tab. The incoming tab isn’t very useful but the outgoing tab allows you to set up an external file link storage service for storing attachments. The general tab provides a link to the return receipts screen which was discussed earlier. It also allows you to specify how scrolling works and get Thunderbird to check whether it is the default client on startup. The data choices tab simply asks whether you want to enable the crash reporter which sends details of crashes to Mozilla. 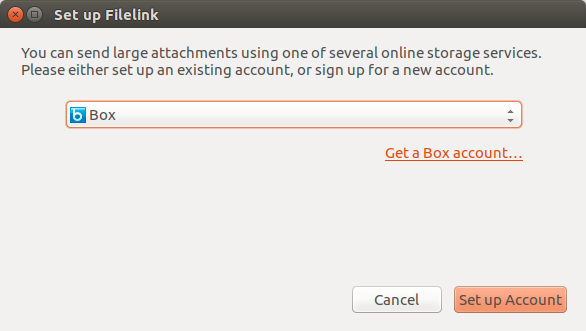 The network and disk space tab lets you configure how Thunderbird connects to the internet as well as configuring offline settings. The offline settings window lets you determine whether to send messages when you go from an offline to online state and whether to download messages when you are switching from online to offline. You can also determine how much space to use for the Thunderbird cache and whether to compact folders when a certain amount of disk space will be saved. The certificates tab lets you manage your certificates. 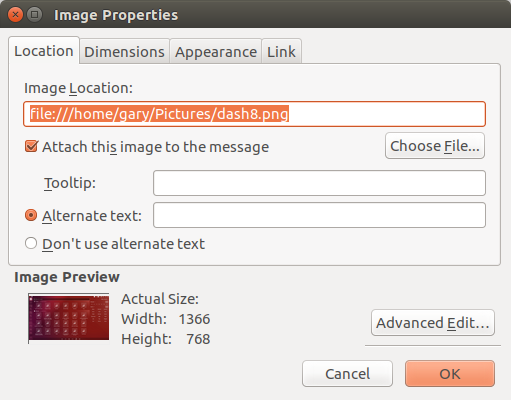 You can also decide whether to show a message pane or not (preview pane). 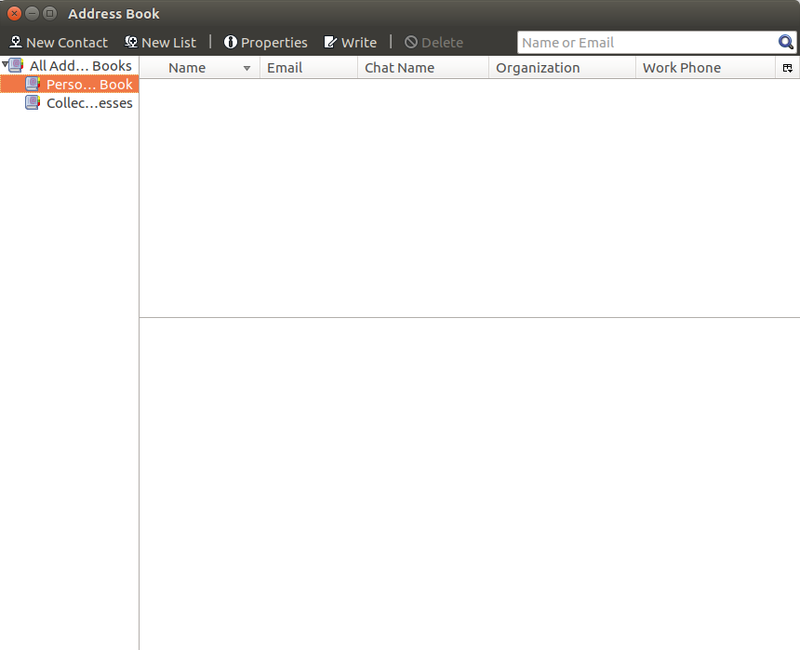 You can access the address book by selecting “Tools -> Address book” from the menu or by clicking on the toolbar option. You can add a new contact by clicking on the new contact button at the top of the screen. The contact tab is where you put the person’s name, email and other contact details. 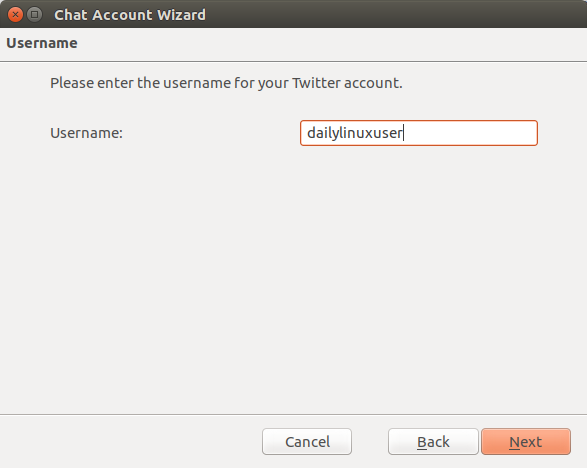 You can also specify a chat name. The private tab is where you enter the address details and you can also specify the person’s birthday. The work tab is where you enter details of the person’s workplace such as their job title, department and address. The other tab has custom fields which you can use to enter any text you wish as well as a notes field. 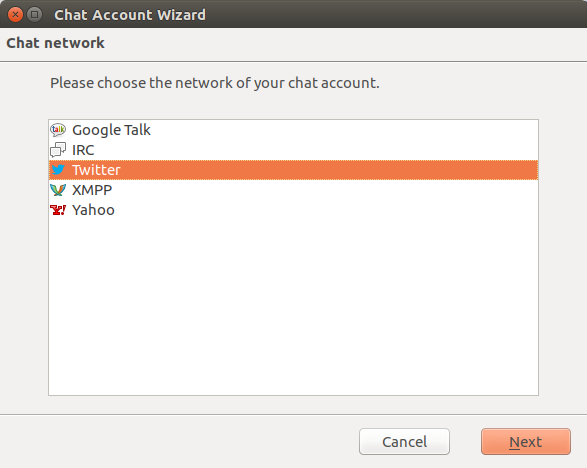 The chat tab is where you can specify chat handles such as Google talk, AOL Instant Messenger (AIM), Yahoo, Skype, QQ, MSN, ICQ, Jabber and IRC. Finally you can add a photo on the photo tab. If you regularly send emails to a number of people then you can create email lists and then when you write a new message you can choose the list as the recipient. Simply click the new list button at the top of the address book screen and enter a name for the list, description and the addresses of the people within the list. 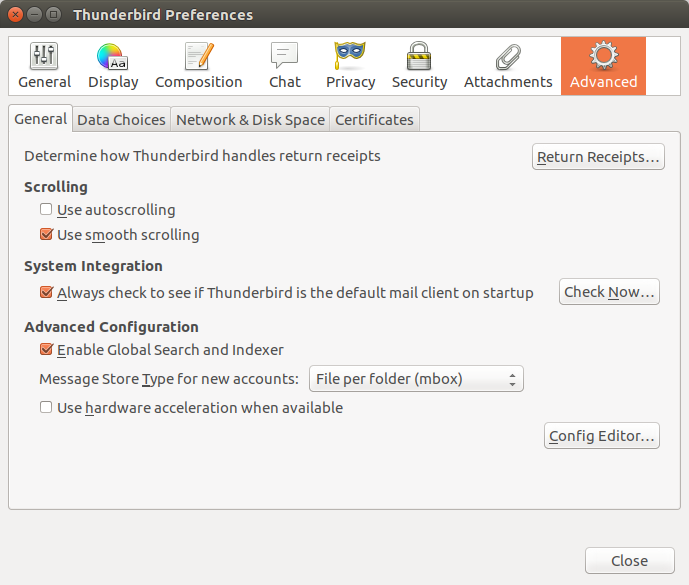 Thunderbird has a number of add-ons that can be installed and used with it. To view the available add-ons select “Tools -> Add-ons” from the menu. 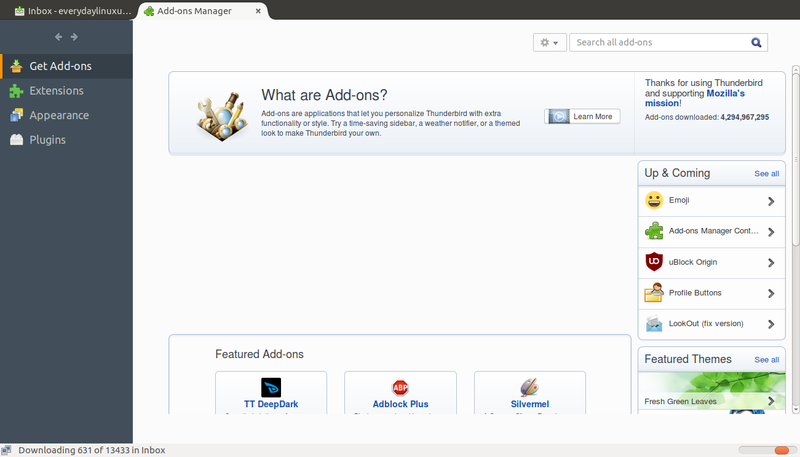 You can install add-ons such as advert blockers, new themes, calendars and many more features. YES! I would too. Thanks Ariel, and thanks Gary! Excellent user guide. Thanks a lot! From what I recall, Thunderbird has continuing issues and problems when it comes to mailboxes that are larger than 4GB in size. This should be mentioned. That was the case with more than … say 1000 messages. I have not had any trouble with that recently, and I have some fairly large mailboxes. I'll have to check the size. But that may be why Gary didn't mention mailbox size. Hi, Sorry I think this was an error on my part. I think I must have hit the wrong button.